We had a small crew come out for last Saturday's workday - kinda surprised anyone made it out this close to the holidays! It was a very interesting day. Dormoy Bathtub - David and Ian Whitaker set about disassembling the Dormoy Bathtub, to begin the overhaul of that aircraft. Roger wants to replace the Franklin motor with a VW engine - hoping for a little more power, more reliability and easier parts availability, I think! As I was leaving at about 4:30 PM they had just dismounted the wing off the little bird. The engine was off around lunchtime! So great progress there! PFM HQ Building - Terry Bledsoe continued spearheading the upgrade of the building. He recently installed water lines into the building (no drains yet!) and his mission for the day was to put the power line in conduit and bury it properly! So... starting right after the BS stopped flowing in the office Terry started digging a trench with a pick-ax and shovel. And with help from Al Sumrall and John van den Eynde (and a pinch of help from me - but just a pinch) Terry finished the job! Way to go, and Thank You, Terry! All the rest of the action revolved around the Triplane. As before, Art has been making progress on the airplane's overhaul. Wings are done except for color coat, and Art has been repairing bits and pieces on the fuselage. The fuel tank's leaks have been fixed - drilled out and re-riveted, the tank just needs sloshing with sealant again. The starboard wooden cheek piece has been repaired. And Roger has figured out how he wants to do the steerable tail skid and has started modifying the airplane to implement the idea. 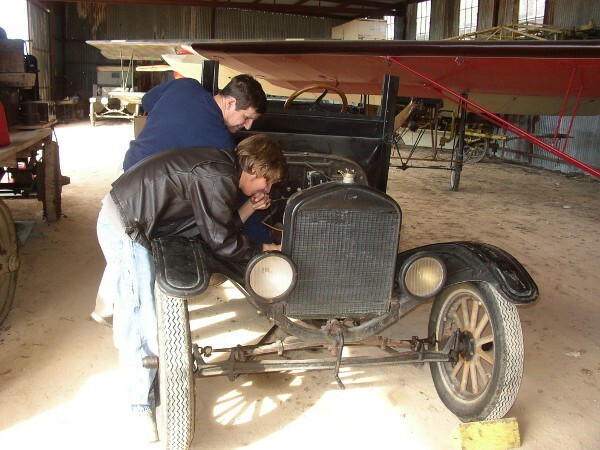 The only visible parts will be the added horns and wires under the airplane that steer the skid. Internally there will be a "walking beam" under the pilot's seat operated by the rudder pedals, with cables running from the walking beam to the skid, and revised suspension arrangement for the skid. The modifications are at an advanced state! What is depressing is that more damage has been identified in the fuselage. Popped screws in the seat fixture, separating weld in a seat brace, etc., etc. The fuselage also seems to have been tweaked and twisted. 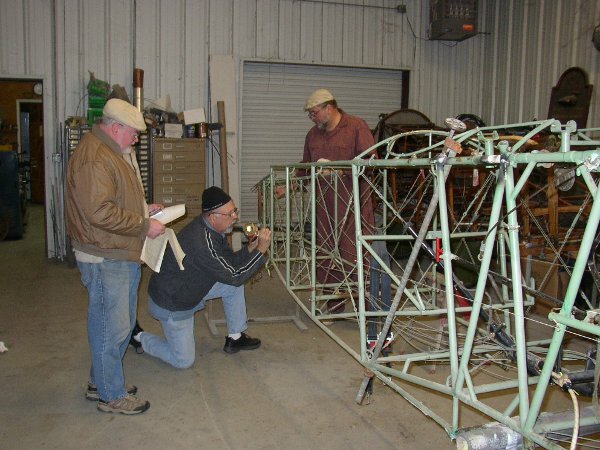 So Dave Edgerly, Dave Orloff, Mike McCormick and Roger all set about creating datum lines on the fuselage with markers and string to see where the structure was out of whack. They set up pipe clamps to apply pressure in strategic pressure points and delicately used a welding torch to judiciously heat some of the tubing. They managed to relieve the fuselage of most of its misalignment. They also replaced the cockpit bracing cables with sturdier stuff (one had broken). The work isn't quite done yet, as putting the fuselage back into alignment seemed to change the tension on several bracing cables immediately behind the cockpit, so some further adjustments will be needed. Much as we hated to strip the fabric from the fuselage it is beginning to look like it really was very, very necessary! !